The location of the complex, the facilities and other establishments around gave an excellent variety. Mohammed that had the bar and resturaunt on the complex was so helpful and friendly. The people in Aqualettings were very good with us. They even let us keep the apartment for an extra 5 hours on departure day at no extra cost. Ozzy at reception was always helpful when there were problems. The location right on the beach (with free sun beds) is lovely. The complex has very good security. There is a shop on site which has most things you need and is very reasonably priced. Путишествовали в 4 с друзьями, конец сентября 2018г. Нам очень повезло. Выбрали апаратаменты 85 м2, двухэтажный, по приятной цене, полностью соответствуют описанию. В номере от утюга до посудомоечной посуды, комнаты просторные. В целом о Комплексе Sunset Beach Resort Aqua, все будет зависеть от того к какому хозяину апаратаментов вы попадете. Море у отеля мутноватое, так что мы ездили в поселок Олюдениз (голубая прозрачная вода), 15 км от Фетхие. Машина сутки - 25 $. Закупались в супермаркетах Kipa, Migros. Очень советуем ресторанчик Nil на набережной, вкусно, опрятно, большие порции. До Мармариса на машине 2,5 часа. В Курорте Фетхие размеренный отдых . Большая часть туристов почтенного возраста леди и джентльмены. Отпуском однозначно довольны ! Хорошая вилла: 3 этажа, 5 спален не считая гостиной с диванами на 1м этаже. Можно с комфортом уместиться большой семьей. Кухня полностью оборудована, удобный стол. Средства для посудомойки и стиральной машины можно купить рядом в магазине на территории поштучно, что особенно ценно для недолгого пребывания. Огромный плюс - 4 туалета: 2 в спальнях и 2 отдельно размещенных. Удобный стол и принадлежности на веранде. Достаточный WI FI: его нет только на 3м этаже, на 1,2 и веранде - стабильный. На территории есть хороший ресторан и магазин с самым необходимым, в 10 минутах ходьбы от комплекса - променад на набережной с огромным количеством рестораном и магазинов. Персонал,пляж первая линия,наличие достаточного количества шезлонгов. В общем сам комплекс очень хороший и приятный, если правильно подобрать коттедж и ХОЗЯИНА или тур агенство которые сдают. 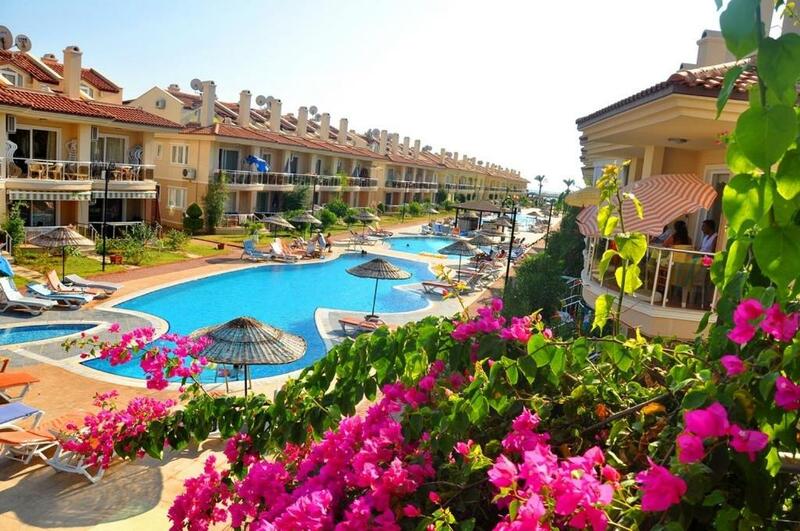 One of our top picks in Fethiye.Featuring a garden, terrace and an outdoor pool and a private beach area with free parasols and sun loungers, Sunset Beach Resort Aqua Lettings is located in Fethiye. Relaxation activities include sauna, massage treatments and Turkish bath. The air-conditioned accommodations comes with a living room, private bathroom and a kitchenette including a dining area. A washing machine and flat-screen satellite TV are also equipped. Free Wi-Fi is available across the premises. At leisure, you can go fishing, cycling and horse riding. The reception works 24 hours, provides room service and currency exchange. Laundry, dry cleaning and ironing services are also available at a surcharge. Fethiye town center is 5 mi away. Shuttle services to Dalaman Airport, which is 27 mi away, can be arranged at an additional charge. When would you like to stay at Sunset Beach Resort Aqua Lettings? This apartment features a patio, electric kettle and seating area. This apartment has a dishwasher, kitchenware and washing machine. This apartment has a stovetop, private entrance and sea view. This villa has a washing machine, private entrance and kitchenware. Sunset Beach Club, Fethiye Çalış bölgesinde bulunan 270 adet Villa ve apartmana sahip, 7/24 güvenliği, 7 adet ortak havuzu, özel sahili, barı,restoranı, marketi ve spa merkezi bulunan denize sıfır bir tesistir. Spor yapmayı seven ve sosyal aktivitelere katılım sağlayan bir kişiliğim. Fethiye aynı zamanda yapılacak aktivitelerin çokluğu bakımından da zengin bir bölgedir, başlıcaları yamaç paraşütü, tekne turu,safari gezileri, rüzgar surfü vb..
House Rules Sunset Beach Resort Aqua Lettings takes special requests – add in the next step! Debit card Sunset Beach Resort Aqua Lettings accepts these cards and reserves the right to temporarily hold an amount prior to arrival. Sunset Beach Resort Aqua Lettings accepts these cards and reserves the right to temporarily hold an amount prior to arrival. It should be more clean. The furniture and beddings doesn’t feel clean. The advertised sea view was quiet a distance away. Could just about see it from the upstairs room. The apartment was not cleaned well at all. Had to clean it on arrival. The Villa not clean at all be careful that the beds sheet and blanket have a bugs and cimex bed bug. All family had skin rash for that. The swimming pool not clean have dust inside. The are no place for your car anyone can park front to your villa. Finally they took 150 Turkish lira for cleaning and they didn't clean as well. Employing More cleaning staff would be helpful - as a cleaner is not always available for any issues which may arise! There are also some days when they do not have a cleaner on site. No toiletries, toilet roll or towels provided at first and had to ask multiple times until provided. Advertised as ‘villa with pool’ but on arrival we were informed that there no pool until May. This was not made clear on booking. Instead we had an empty pool with a small amount of dirty water in it. Kitchen and all cutlery/crockery fairly dirty. Balcony door of one bedroom did not lock - reception informed of this but they were not bothered and took no action. No cot sheet for cot, luckily we had brought our own! Everythink was very good overoll.